May 17, 2017 – Newburyport, Massachusetts - UFP Technologies, a producer of innovative, custom-engineered packaging and components for medical devices, orthopedic implants, fixation devices, and surgical instruments will be exhibiting at MD&M East from June 13-15 at booth #1545. MD&M East is the largest medical manufacturing event on the East Coast, bringing together thousands of medtech suppliers and manufacturers, displaying the latest innovations, materials, and processes. At this year’s show, UFP Technologies will highlight its FlexShield® sterile barrier integrity protection solutions. The expanded offering now includes standard configurations for a variety of applications including surgical instruments, orthopedic implants, fixation devices, and more. 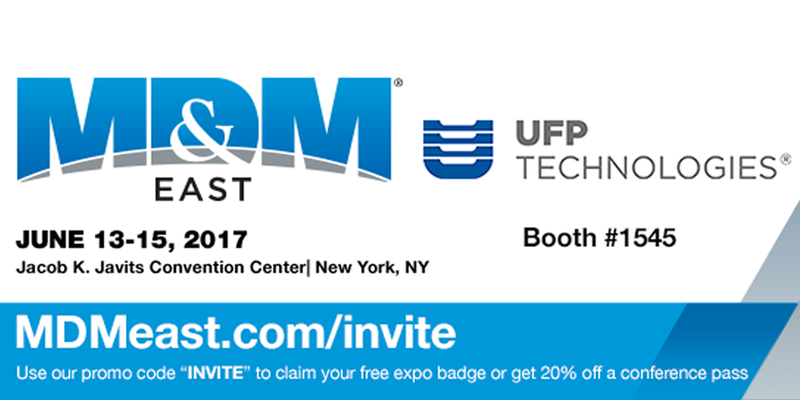 Use our promo code INVITE to claim a free expo badge, or get 20% off your conference pass, at www.MDMeast.com/invite.